The 10mm auto cartridge with a height of 0.992" has an average speed of 1199 fps from a 6" barrel and has an average 546 foot pounds per square inch of energy, while the 40 Smith & Wesson has a height of 0.85" travels around 1074 fps from a 6" barrel and has an average 423 foots pounds per square inch. The numbers don't lie and neither does the history. The 40 is nothing more than a short 10mm, in fact the 10mm is it's parent case having been developed in the 80's for the FBI. Problem was however the round was to "hot" for most of the agents to handle so they settled for slightly less "kicky" 40 Smith & Wesson. 10mm - In a standard GLOCK 20 (10mm) the capacity is 15 rounds. 40 Smith & Wesson - In a standard Glock 22 (40 S&W) the capacity is 15 rounds. 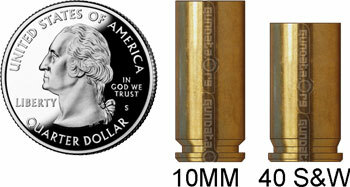 Capacity is equal, because the width is virtually the same .424 for the 40 and .425 for the 10mm. 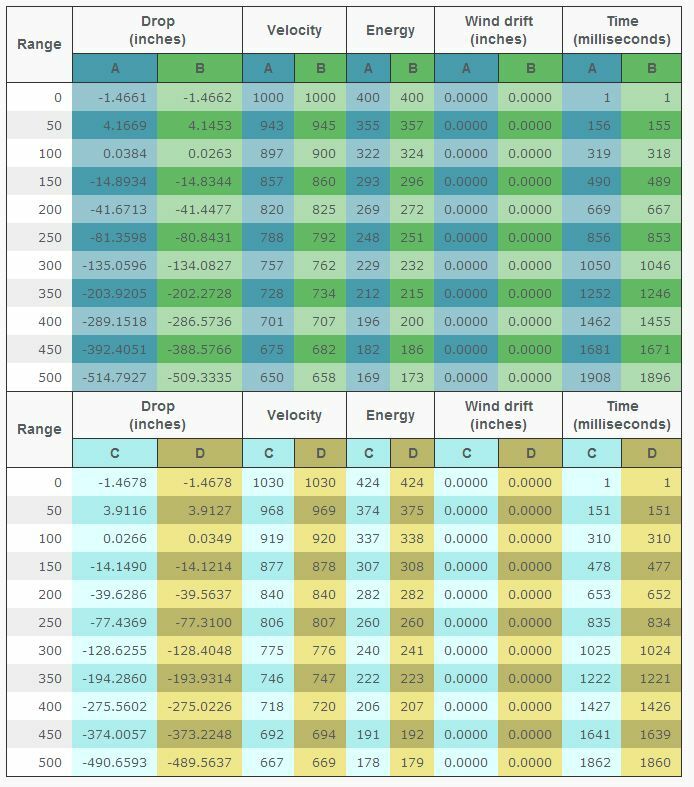 The 10mm (0.96 rr*) has significantly more recoil than the 40 (0.74 rr*). RR is short relative recoil or rifle recoil, and is a value expressed somewhere between .25 and 3. On average the 40 is used in every day carries by law enforcement, not because it hits harder but because it hits hard enough and allows for faster follow up shots in the hands of most people. The 10 is carried by those people who are not recoil sensitive. 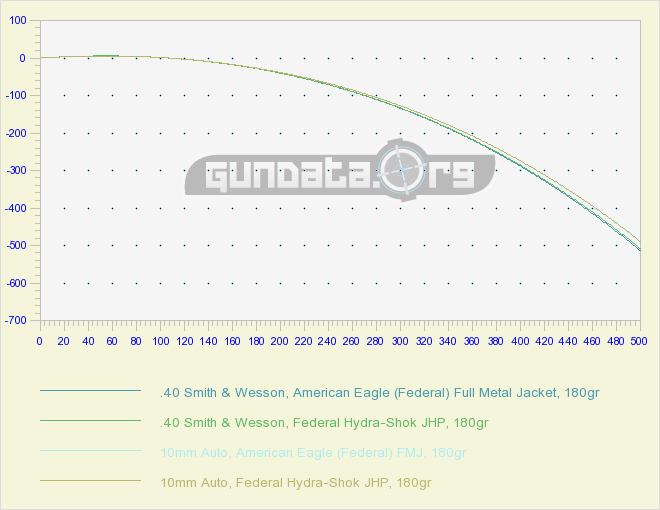 The above chart tracks average 10mm and average 40 bullet trajectory. Bullets of the same weight and manufacturer were used. You can better see what's going on by looking at the numbers. We are personally big fans of the 10mm it's an amazing round that packs a punch similar to a revolver rounds but whose capacity fits in a semiautomatic pistols. In our opinion it's an amazing cartridge. The 40 S &amp; W is also a great round for those who are recoil sensitive and more than capable in urban enviornments. You can't go wrong with either for an everyday carry handgun, if you are headed into the woods you might want a 10mm.